Title: Vous Avez Bit Bizarre? 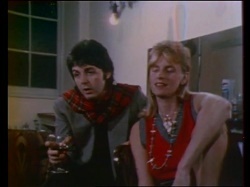 Other Sources: Paul McCartney - Maccaspan Vol 3 1975 ( FAB Productions) (First part only); Paul McCartney: 1973 - Sept 1975 (FFD Productions) (most of 2nd part and a bit of first part in bad black and white). 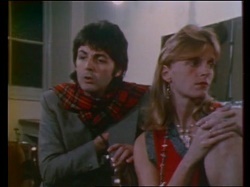 Notes: Paul & Linda were interviewed in their dressing room following their concert in Aberdeen, Scotland. It was for a French TV show called "Vous Avez Bit Bizarre?"" and broadcast in colour. Apart from the interview they also played footage of songs presumably filmed at the Aberdeen concert: "Letting Go"; "Listen To What The Man Said" and "Yesterday" which were all shown almost complete. The interview and songs were broadcast in two segments 25 minutes apart. The first segment ran for 5:17 mins (including the hosts introduction) and the second segment for 5:45 mins.